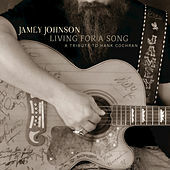 Jamey Johnson is the most critically acclaimed country singer of his generation precisely because he throws curveballs like this: a warm, stately, duet-filled full-album tribute to songwriting legend Hank Cochran, he of "Make the World Go Away" (here co-starring Alison Krauss!) and "I Fall to Pieces" (Merle Haggard!) and such. The guest list is stellar (Strait, Costello, Womack, Gill), Johnson's tough but tender voice is a reassuring constant, and the songs are all-timers: Best in show is the Willie Nelson-abetted "Don't You Ever Get Tired of Hurting Me." Note the lack of a question mark. 2012 Mercury Records, a Division of UMG Recordings, Inc.